Have you heard that The Meritage Resort has a new sister property called Vista Collina Resort? It is Napa’s newest luxury resort. I had the opportunity to go to its Grand Opening party in July and see some of what it has to offer. 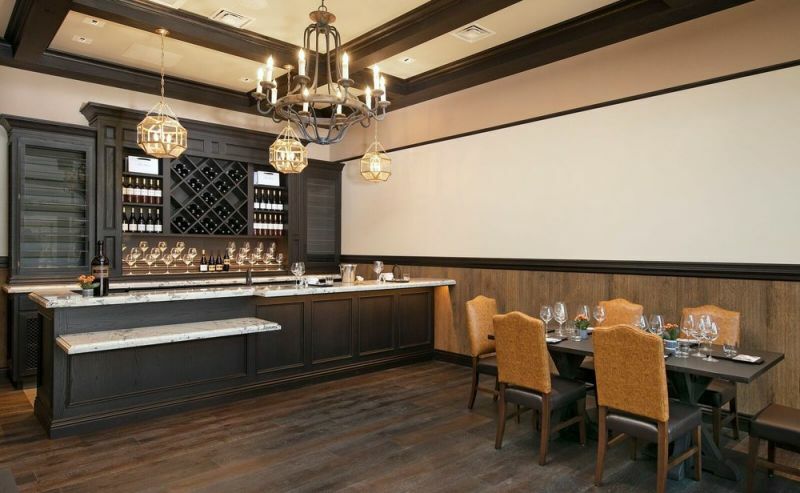 My favorite part is the new tasting rooms at “The Village” which is a dining, retail, and tasting room complex. Two of my personal favorite wineries have opened tasting rooms on the property. Luna Vineyards and Mi Sueño Winery. 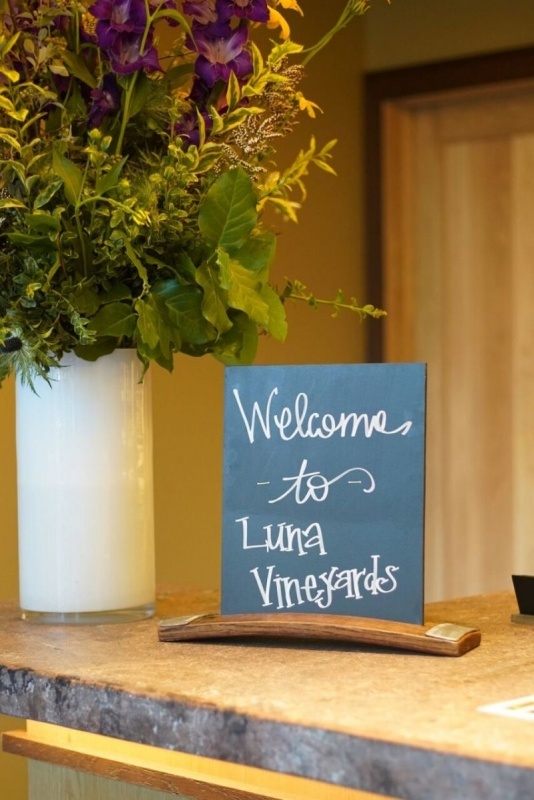 We have held a membership at Luna Vineyards for many years. It was the first winery membership we ever joined. In fact, it is one of the few I have remaining as we don’t have time these days to drink wine for just our own pleasure. We usually have a bottle from other wineries to review for our blog. It makes life exciting, but also makes us sad that we don’t get to enjoy our old favorites very often. In my opinion, the Sangiovese Luna produces is the best I have tasted in Napa Valley, so I doubt I’ll ever be able to give my membership up. I also love their winemaker Shawna Miller and the other wines she produces. No matter which you choose, the Classico or the Reserva, Luna’s Sangiovese is a winner! Note: *Every year I try to decide which of their Sangiovese’s I like best from their releases. Sometimes it is the Reserva, and sometimes it is the Classico. This year for me the Reserva wins, but the Classico isn’t far behind. 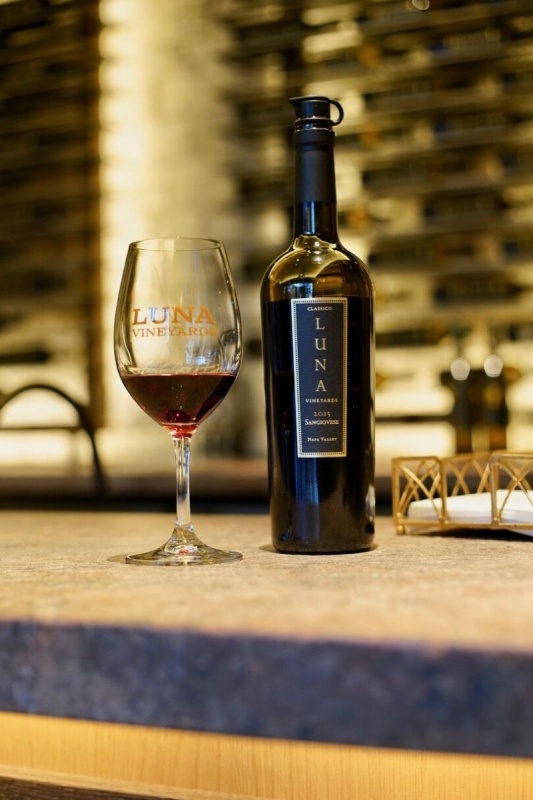 Even as a member of Luna Vineyards, I had no idea that they were opening up this new tasting room. I found out at the opening party for members of the press. I was both happy and surprised to see them there! After all Vista Collina is closer to my house. Yippe! Its new location makes it even easier for me to nip over for a wine tasting on my way home. 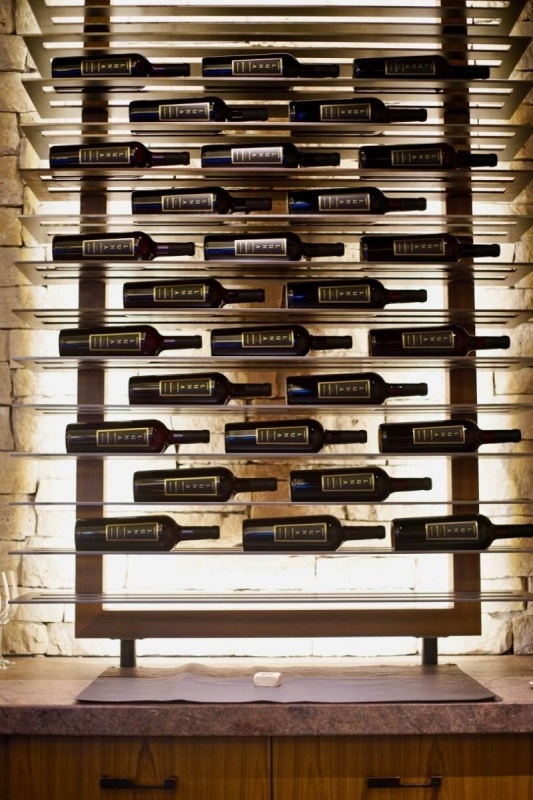 How cool is this wine display rack at Luna Vineyards new tasting room at Vista Colina? I really like the modern and cool vibe that Luna has created in their space. It is really different than their tasting room at the vineyard. 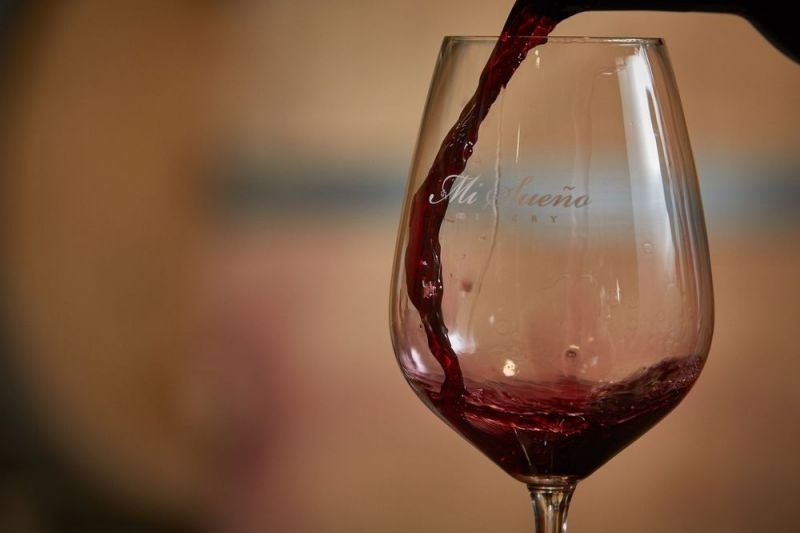 I can absolutely see ourselves stopping in on the way home for a sip as it is open until 7 p.m.
You may have read my article a couple of months ago about one of my new favorite wineries Mi Sueño Winery. I was so taken by the people, their story, and their wines they instantly went to the top of my list for must-visit places in Napa. Not mentioned is Mi Sueño Napa Valley Cabernet Sauvignon. It is delicious! Before, tastings for Mi Sueno were held in their small winery in an industrial park. They could only accommodate a few people at a time on request in their barrel room area. This new tasting room has both seated areas and a stand-up bar. They have maintained a homey feel to their space and I felt despite the large crowd, I had the same personal experience and warmth as I had at their winery. That is quite the accomplishment. The glasses at Mi Sueño are all set up for a wonderful tasting. 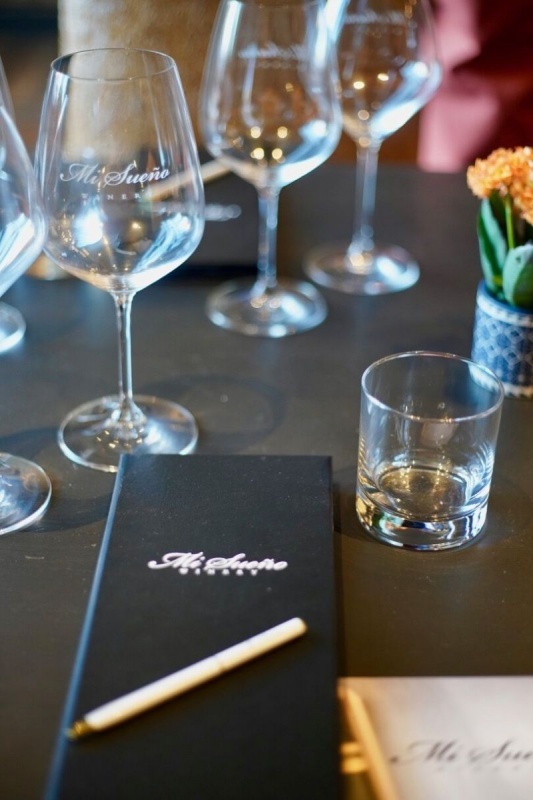 If you visit, my suggestion is that you try their 2015 Carneros Chardonnay and their 2014 Napa Valley Syrah. Both are delicious. That having been said, don’t forget their fabulous Russian River Pinot Noir. 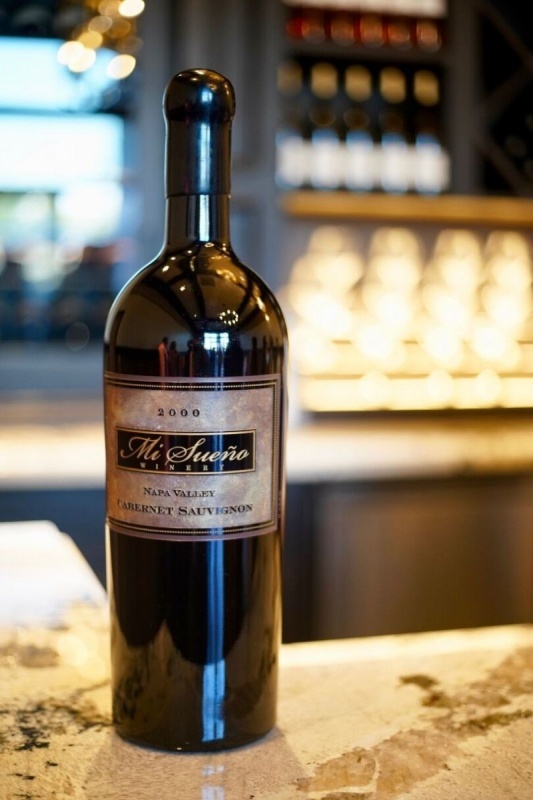 Thanksgiving is right around the corner and this wine would be the star of your holiday feast. I can’t wait to get back to Vista Colina and try out the restaurants, and resort facilities. With these quality wines on site, visitors will have a hard time wanting to leave. I know I would. 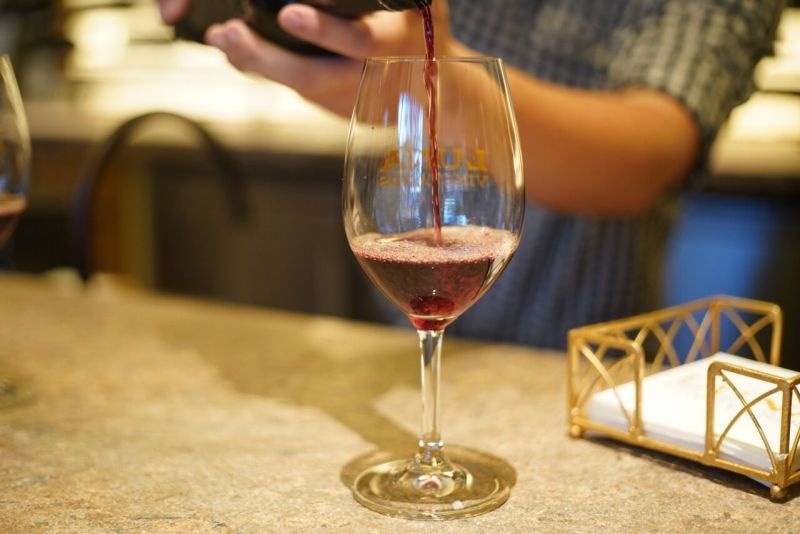 Your affection for Luna Vineyards is contagious – it sounds like you’re talking about a long-time friend and that makes me want to visit too. I would be angling for a big glass of that Sangiovese – all of them! How wonderful! I wish we had something like this in Paso. We would love to be able to share space with other wineries. I love the idea of having tasting rooms all in one general location. Interesting. I am not familiar with Luna Vineyards. Thanks for the introduction.